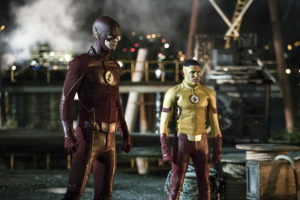 There are only a few days left until the Season 3 premiere of The Flash, titled “Flashpoint,” and those familiar with DC Comics history as well as the Flash Season 2 finale know what that title entails: Barry Allen has gone back in time and prevented the Reverse-Flash from killing his mom, creating a new reality in the process. Much of that “new reality” has been revealed in trailers: Wally West is Kid Flash, though he hates that name, and he has a possibly surprising partner in crimefighting. The Rival (Todd Lasance), a speedster dressed in black, is determined to make it so that no others can outmatch his speed. The other world’s Cisco is a billionaire. 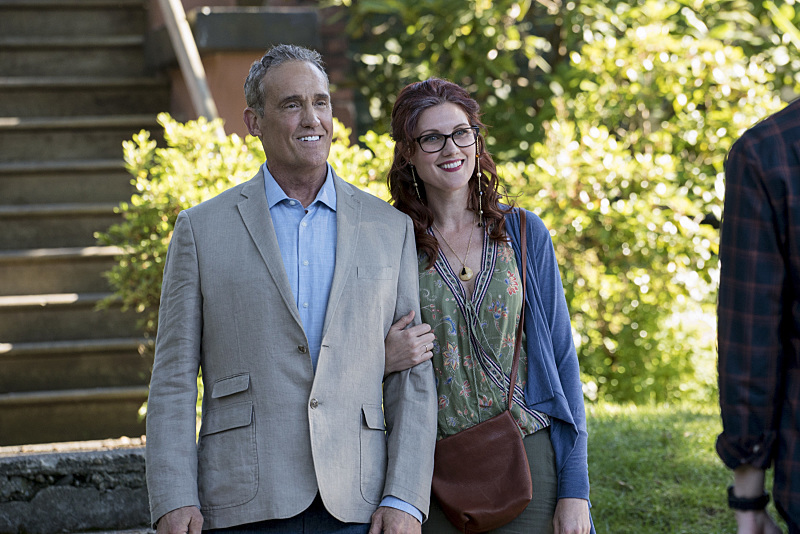 And Barry Allen’s beloved parents, Nora and Henry, are both still alive, happy, and wanting him to move out of the house already. Barry Allen has almost everything he wants in this new world… except for one thing: Iris, who doesn’t really know him well in this altered reality, yet seems drawn to him in the same way he is to her. 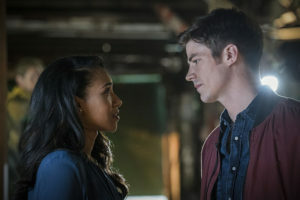 This season premiere might be one of the best uses of Candice Patton’s Iris in the series, giving her ample and deserved screen time as an important part of Barry Allen’s life (or lives). In a world of unreality, Iris seems to offer Barry a dose of reality, and I like that The Flash recognizes that Iris (and Candice) are an integral part of this story. 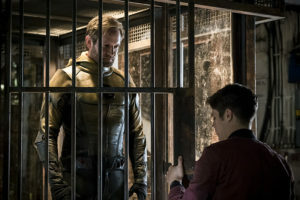 Matt Letscher’s Reverse-Flash is around and tormenting Barry with the changes he has wreaked. Much has been written about the notion that even though he always has the noblest of intentions, Barry has in some ways been the villain of this story, and Eobard is more than happy to tell him that. Letscher is menacing as Eobard Thawne, and I’m still impressed by how much he reminds me of Tom Cavanagh’s take on the character in Season One. (Harrison Wells of any universe sadly seems to be absent in the premiere. Boo! Hiss!) The best villains, to me, are the ones who think they are doing the right thing; Eobard Thawne, in his own twisted way, seems to be that, and Letscher is one of the MVP’s of this first hour. What else is there to say? Joe West in the Flashpoint world is a shell of the Joe we know; also, there is a surprise guest appearance that I don’t think has been spoiled yet. I hope it is not spoiled because it had me grinning from ear to ear. And, yes, Keiynan Lonsdale’s Wally is Kid Flash and the costume looks really cool – though his frequent blurring is a little distracting. If the mask doesn’t hide his face enough, then maybe he needs a better mask. Having lost a parent myself at age 19, I would give anything to be able to change history to see my dad again. But, as Barry Allen may learn, you need to be careful what you wish for. 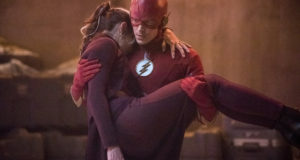 In addition to being a good episode of a superhero drama series, “Flashpoint” also has a lot of heart that is also present in every episode of the show. A lot of that is due to Mr. Grant Gustin himself, who plays Barry with a vulnerability and heart that really does make him perfect for this take on the role. I will warn, though: This episode made me, a man in his thirties, teary-eyed, as The Flash sometimes does, so prepare the tissues. Is the finale perfect? It’s pretty darn good. There are mechanics of time travel in the Arrowverse that I will never totally understand; for example, I don’t understand how Barry Allen still has his speed powers if what happened to his mother never occurred, unless the same accident happened in the Flashpoint universe. (I’m thinking not, since the STAR Labs building, now owned by Ramon Industries, looks pristine) But if we can turn our brains off and not think about it too much, again, it’s a really good hour of TV. I’m curious what will happen next, but then again, it’s not like I wouldn’t be watching The Flash — one of my favorite shows on TV — anyway. Still, there’s a reason this is The CW’s #1 show — it’s really well done, with good actors, great effects, writing, directing… it’s a fine package. 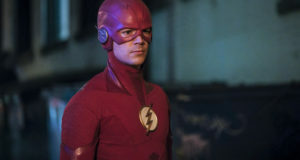 The Flash “Flashpoint” airs October 4 on The CW. See some preview images below, and check out our interview with the show’s Executive Producers here! Previous: 2016 FlashTVNews Awards: Pick The Best & Worst Of Flash Season 2!